Photo by Rachel Torgerson. African Student Union members Elvire Rubyiza and Kenny Nindorera run a table in the Atrium to collect books for the Worldwide Book Drive. The organization will collect books until May 4. It’s that time of the year. School’s almost over, and its time to figure out what to do with all the books from this semester. Normally, options would include keeping them, lending them to a friend or selling them back for a measly sum. 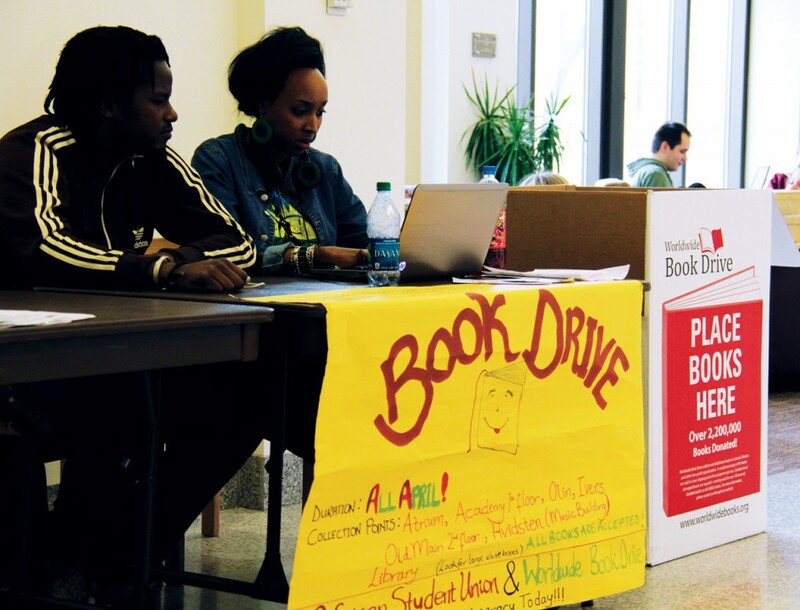 But this year, the African Student Union is asking the campus to donate old books to the nearly 800 million illiterate people around the world during their book drive through the month of April. The African Student Union, in its fourth year as a student organization, decided this year to become more visible by organizing some sort of community service. The only problem was, they couldn’t decide on what. After months of searching, they were approached by the Worldwide Book Drive—an organization that reuses second-hand books and sends them around the world. Zacharie Petnkeu, a French professor and the faculty advisor for the African Student Union, explained that although they weren’t looking to do a book drive, when they were contacted by WBD, it all made sense. “We know the importance of books, and many of us have had experience with lack of books at schools,” Petnkeu said. He said that because a large portion of the donated books go to Africa, it was a charity that was very welcomed by the student organization. The Worldwide Book Drive began seven years ago by two graduates from Brigham Young University, and since then has donated more than two million books globally. The WBD does not do the distributing of the books themselves but instead partners with several non-profit organizations, including Myanmar Book Aid, Books for Africa and World Vision to distribute the books. Of the donated books, 150,000 have gone to underprivileged youth and schools right here in the United States. In addition, 250,000 textbooks have been donated to Africa. Textbooks specifically are what ASU is hoping to collect a lot of this April as students and professors clean out their shelves. Their goal is to collect 500 books, and they are already well on their way. With two weeks until the drive ends on May 4, Awuah believes they have already collected about 200. Drop-off boxes have been placed around campus. Right now there is one by the Coffee Stop, one in the music building by the couches, one on the second floor of Old Main and one in the entrance to the library. However, more boxes will be going up soon. Additionally, ASU is looking at working with the English Club to get even more books and to work toward greater publicity. ASU is hoping that this event raises more awareness about who they are and what they do. When they began four years ago, Petnkeu said that African students at Concordia felt a sense of emptiness and wanted a place where they could come together to feel at home. However, now it has grown into something much more. Over 30 students from many countries across the world are now involved in the organization. “This is a campus for diversity. We want to be a part of an effort to improve and promote diversity,” he said. Overall, Awuah and Petnkeu’s dream for this book drive is to give the same gift of education that so many Cobbers already have to those around the world without that same reality. Awuah concluded by urging all students to donate what they could. Management concerns the coordination of people and resources to add value and achieve organisational objectives. By extending study from the traditional academic year into the summer period this course allows a full honours degree in Business Management to be achieved in two years..